We have essentially understood this for a long time already, but it was not obvious either. The Russian collusion meme had only two options without a grey areas. It was or it was not. Right now the evidentuary trail has brought us up upon the reality that the FBI has been literally fabricating FISA warrants in order to surreptitiously wire tap anyone they please including political opponents. This behavior is why Trump is now in power. The people in their collective wisdom understood all this and attacks by the DEEP STATE is steadily producing more converts to collective of WE THE PEOPLE. I think it is now almost half of the voting public. The Democrats are in profound trouble and do not know it. These voters are not soft in any way. They have become hard supporters of Trump. Nothing the DEMs can do will switch them ever. It is telling that Blacks and Hispanics are also switching over and approaching the same numbers as Whites. This movement is about Americans first and the Dems have forgotten all that and will now take years to be retooled as the loyal opposition..
Read carefully. the story is not a good one. If you suffer from depression you will need to self heal through diet changes and fitness workups along with meditation. Also experiment with CBDs as well. What is out there is countra indicated at best and is no resolution. Yet the problem is seaparate from your good health and has tio to be objectively controled. Good item though and worth the effort. 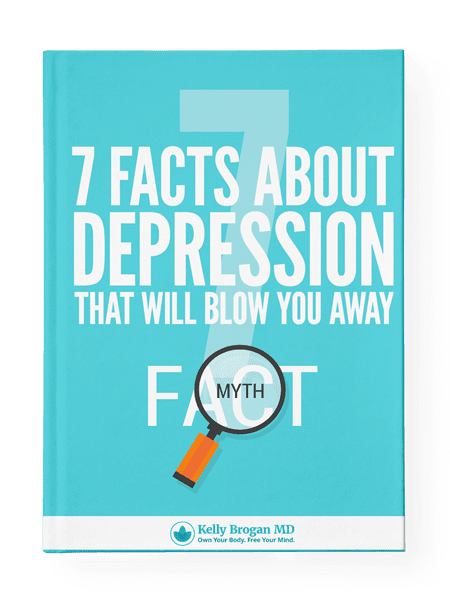 What you think you know about depression is probably a myth. A silent tragedy in the history of modern health care is happening right now in America, but no one is talking about it. We have been told a story of depression: that it is caused by a chemical imbalance and cured by a chemical fix — a prescription. More than 30 million of us take antidepressants, including one in seven women (one in four women of reproductive age). Millions more are tempted to try them to end chronic, unyielding distress, irritability, and emotional “offness” — trapped by an exhausting inner agitation they can’t shake. Despite what you’ve been led to believe, antidepressants have repeatedly been shown in long-term scientific studies to worsen the course of mental illness — to say nothing of the risks of liver damage, bleeding, weight gain, sexual dysfunction, and reduced cognitive function they entail. The dirtiest little secret of all is the fact that antidepressants are among the most difficult drugs to taper from, more so than alcohol and opiates. While you might call it “going through withdrawal,” we medical professionals have been instructed to call it “discontinuation syndrome,” which can be characterized by fiercely debilitating physical and psychological reactions. Moreover, antidepressants have a well-established history of causing violent side effects, including suicide and homicide. In fact, five of the top 10 most violence-inducing drugs have been found to be antidepressants. Even if we accepted the proposition that these drugs are helpful for some people (82% of which is due to the placebo effect, according to Dr. Irving Kirsch), extrapolating a medical cause from this observation would be akin to saying that shyness is caused by a deficiency of alcohol, or that headaches are caused by a lack of codeine. And what about a genetic vulnerability? Is there such thing as a depression gene? In 2003, a study published in Science suggested that those with genetic variation in their serotonin transporter were three times more likely to be depressed. But six years later this idea was wiped out by a meta-analysis of 14,000 patients published in the Journal of the American Medical Association that denied such an association. Seven percent of all visits to a primary care doctor end with an antidepressan and almost three-quarters of the prescriptions are written without a specific diagnosis. What’s more, when the Department of Mental Health at Johns Hopkins Bloomberg School of Public Health did its own examination into the prevalence of mental disorders, it found that most people who take antidepressants never meet the medical criteria for a bona fide diagnosis of major depression, and many who are given antidepressants for things like OCD, panic disorder, social phobia, and anxiety also don’t qualify as actually having these conditions. Dietary modifications (more healthy fats and less sugar, dairy, and gluten); natural supplements like B vitamins and probiotics that don’t require a prescription and can even be delivered through certain foods; minimizing exposures to biology-disrupting toxicants like fluoride in tap water, chemicals in common drugs like Tylenol and statins, and fragrances in cosmetics; harnessing the power of sufficient sleep and physical movement; and behavioral techniques aimed at promoting the relaxation response. This is an important breakthrough as evidenced by the rapid progress with other cultivars. The promise is a form of safer wheat, which we certainly do not wish to give up. After all leavened breads always beat out grain porridge. At the same time, this technology will also now be applied to many potential cultivars we have never particularly worked with. Not least almost all of out tree species. Acorns without tannins would be welcome and a little flavor even better. Pine nuts need to also be adjusted for massive reforestation worldwide. As i have been suggesting, we have hardly begun. Perhaps someday a group of local farmers can work to optimize their local bio-me this way and we can spend our lives sampling bi-omes. The interpretation is nonsense of course but the end of the ivory trade made trips to Europe meaningless. 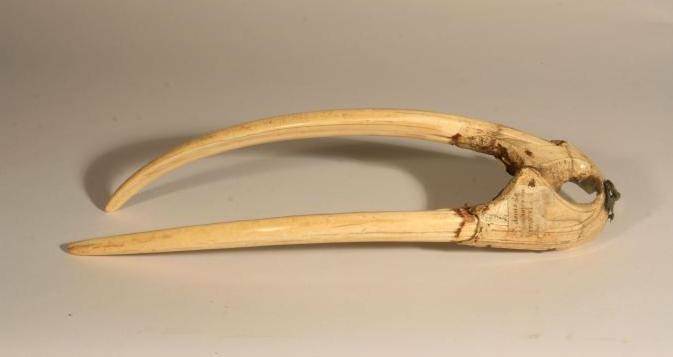 What this proves in spades though is that the Vikings were harvesting walrus for ivory in particular. They also took the meat and oil as well and this sustained them. 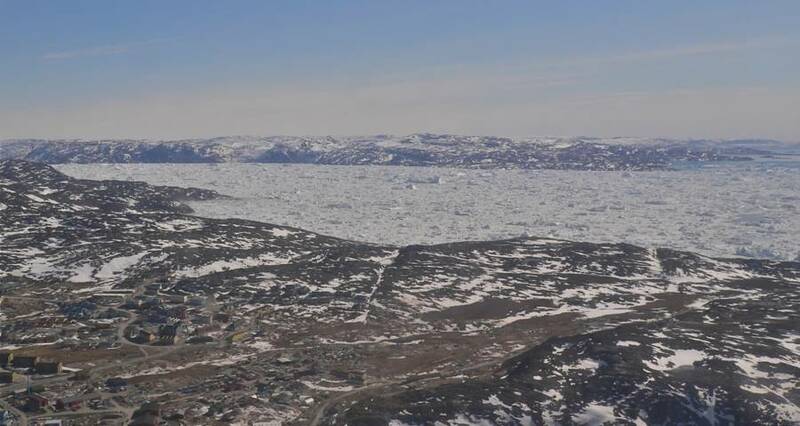 Thus our understanding that the last of the Greenland colony actually crossed into Ungava bay to their camps there and then overland to Hudson Bay is very creditable. I do think that they likely ran out of ivory and this made Greenland unnecessary. It also cut off Vinland through Lancaster Sound as well and explains its draw down as access was still possible but too difficult then. His questionable behavior even after the rise of Trump, when more sensible men might have gone for cover has ended badly. This man received a blanket pardon on been repatriated from Vietnam, mostly because no one wanted to hear anything more about Vietnam. Did anyone else need it? And his immediate removal after the Forestall explosion prevented him from facing his peers in the pilot's mess. Even an obvious accident gets you a court martial in order to determine responsibility in the Navy. Somehow none of that happened. This is a career we have all watched and he was utterly unsuited and untrained as well for command yet he strived for it. It is possibly a blessing for him and for us that he never did get it. RIP . And now, John Sidney McCain, III is a corpse in a morgue awaiting his state burial. It is as it should be, perhaps for the first time in his entire life. McCain – the holy terror of teenager and Naval Academy cadet, mad pilot and poster child for the horrors of the towering enemy we faced for our very survival as a Republic in Vietnam, and political animal for much of his life – clearly was not at home in this world. In a world filled with people who are all pretty much accountable on a daily basis for their decisions, choices, actions, and for the pain they have and are causing, John McCain was missing from his post. Where failures and character flaws occur in all families, when they occur in the important chapter of the national narrative called “Military Heroism And Sacrifice In The Name Of National Greatness And Security,” something must be done. And what was done? Props, propaganda and prose all came forth, and we aren’t done being propagandized and prosed to death just yet. The funeral is coming. While much has been written about John McCain, it’s the stories we haven’t been told that bother most people. How he made it through the Academy on our dime with massive numbers of demerits and low academic performance, how he avoided courts martials and discharge from the Navy after the first two plane crashes and flying through the telephone lines in Spain, all before the interesting roles he played on the deck of the USS Forrestal before, during and after it burned. The story of being shot down, likely by friendly fire, and his subsequent capture and torture by the “North” Vietnamese (a state construct in its own right) is rarely told in detail, but rather bundled in the official narrative under “courage.” His divorce of his first wife and disconnect from his first family – understandable because of what war, separation and the stress of a military society do to human beings – is not discussed. Nor are the personal, political and financial machinations that led to his first Congressional seat, and shortly thereafter, a secure Senate seat for Arizona, a seat he has held since this weekend. From being a savior of the A-10 Warthog program, refusing to allow it a natural death — ironically the aircraft known for causing the most friendly fire and civilian deaths — to saving Obamacare from the breach, to reliably supporting projects to change governments overseas, all while waging low-level but steady combat against liberty and the Constitution at home, McCain was a busy man, and a well-connected, well-funded politician. The actions of McCain as Senator are legion, and while no doubt people of various political stripes may find at least one or two things to laud in his progressive neoconservative warmongering and state-strengthening agenda in over three decades, in reality he earned no loyalty. This glowing yet strangely surreal obit by Jeff Goldberg of the leftward progressive and warmongering Atlantic says it all – and has it all wrong. Goldberg links John McCain to Anne Frank – someone who cares about the underdog and has a deep moral compass. To study John McCain’s life and times would lead one to conclude many things, but that he cares about the underdog and was guided by a deep sustaining morality would not be among them. A better way to understand John McCain is to see him for what he really was and what he never escaped, although in his wistful moments one wonders if he dreamed of it. He was a child of the state, the military state specifically. 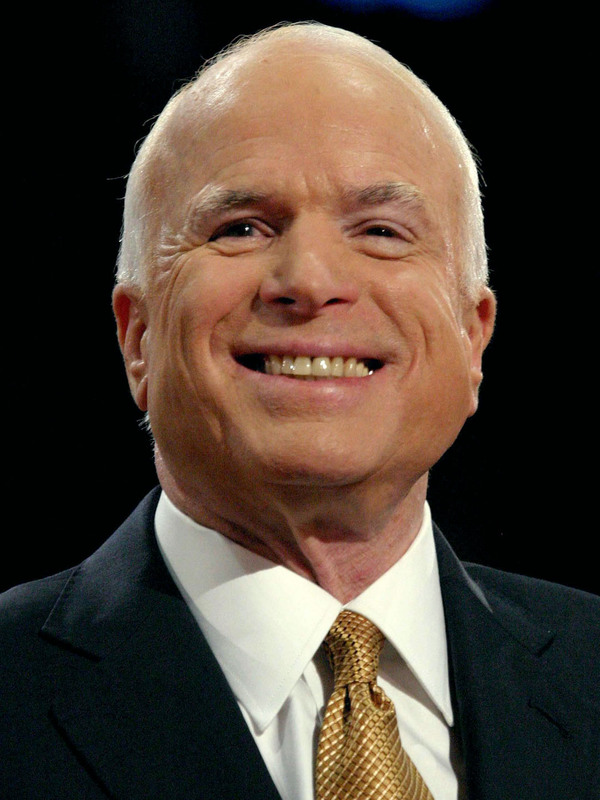 He was the namesake of men who fought for the state, sacrificed their principles and families for the state, he was schooled by the state, both in the many military base schools he attended as a child, then the Naval Academy, later the US Navy, even later a prison camp – and in all of these places John McCain was treated and handled just a little bit different than the average Joe. In every way, he owed his very life and his very liberty to the fact that he was deeply connected to the elites who are the shining beneficiaries of the American empire. Later, as long-serving Senator and presidential candidate he became one of those elites in his own right, and earned every drip of contempt by the thinking people — and every plaudit by state mouthpieces — on his own merit. I’ll never forget a story I heard, where, in the privacy of an elevator (with some people who didn’t count as witnesses) McCain repeatedly jabbed a fellow Senator in the chest while making his point and/or intimidating his inferior. Even after he learned to box at the Academy, as Robert Timburg writes, he “would charge into the center of the ring and throw punches until someone went down.” For a national narrative that likes physical courage and loves the quick fighter, McCain was tailor-made. Timburg, in writing about McCain’s Naval Academy days, was extraordinarily prescient. McCain was “…an unofficial trail boss for a lusty band of carousers and partygoers known as the Bad Bunch.” That lusty band of carousers and partygoers we have seen before in our lives. When that group persists for decades and rules an empire, it is because they are consistently protected from the consequences of their own decisions and actions. Joe McCain, John’s younger brother, took a different path, where he would not become rich or powerful, where he would be accountable for his decisions and actions. He is not lauded in the media, and in fact was ridiculed when brother John was running for President in 2008 for calling 911 to find out what was happening in a traffic jam on the Wilson Bridge. Both were children of the state. Joe called 911 innocently, because why not, it’s there to serve me! John rained hell on governments and populations around the planet, including his own, for similar reasons. It’s a kind of entitlement mentality, and it is as understandable as it is deeply immoral. In John McCain’s lifetime, the US Government has nearly quadrupled in size and scope, while popular trust in government has collapsed. Solutions to local and global problems today however are far more accessible to far more people. Today, no one would call 911 for a traffic report when they have real time traffic mapping in their cars, and a full range of productive things to do while waiting. Technology and human nature both favor decentralization and individualism whenever they can get it, preferring liberty over lockstep marching in spitshined boots and buckles that young John resented so much at the USNA. Perhaps he had an inkling about the future after all. All of a sudden the internal economy of regulation creation is actually market driven. That means the costs have to be found by offsetting eliminations. Needless to say the low hanging fruit got clipped in a hurry. Before this a government employee would prove his effectiveness and importance by creating a regulation however wise. It is easy to get those same employees to toss the ones that are not so important. The math is straight forward. We will converge downward to a bedrock of regulations we must have and even these will be constantly stress tested. Better yet it is all happening out of the public eye. Costs related to new government regulations are on pace to decline for the first time on record as a result of President Donald Trump’s deregulation agenda. New regulations finalized by the federal government so far this fiscal year will save American taxpayers $5.8 billion, according to federal data reviewed by the American Action Forum (AAF). With two months to go in the fiscal year, federal agencies are expected to save even more, making 2018 the first year when new regulations resulted in net savings to taxpayers since AAF began to keep track of the data in 2005. Trump signed an executive order shortly after taking office in 2017 that directed federal agencies to eliminate two old regulations for each new regulation they create. In addition, the order instructed government agencies to offset the costs generated by each new regulation with savings from cutting the old ones. The Trump administration also issued a regulatory budget, which capped the total regulatory costs some executive agencies can accrue at net zero and set regulatory savings goals for others. In total, the federal agencies are on pace to double Trump’s savings goal this year. 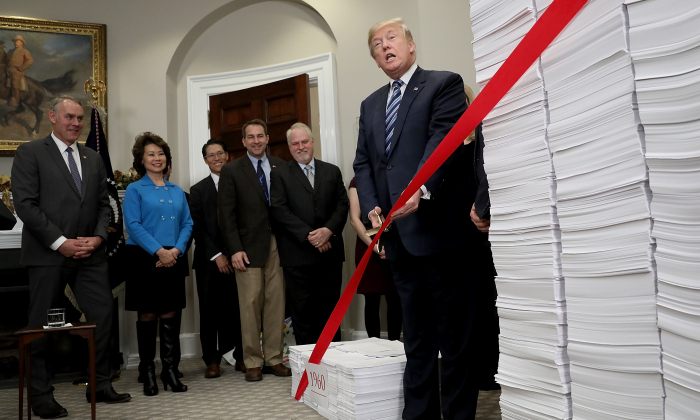 “It’s pretty much in its entirety driven by the regulatory budget executive order,” Dan Bosch, the director of regulatory policy at AAF told The Epoch Times. This year, a Medicare regulation by the Department of Health and Human Services tops the list of cost-cutting regulatory actions, saving taxpayers $1.5 billion. A revision to food-labeling regulations by the Food and Drug Administration is second on the list with $1 billion in savings. The departments of Labor, Health and Human Services, Justice, and Transportation lead the rest of the government in regulatory savings. The four agencies’ regulatory actions will save taxpayers $3.4 billion. Meanwhile, the departments of Interior, Energy, and Defense are the furthest behind on their savings targets. The Department of Interior does have a regulatory action on deck that would push it past the savings target if adopted by the end of the fiscal year on Sept. 31. This isn’t the case for the Energy and Defense departments, neither of which has proposed regulations resulting in savings. Those departments may be trailing because it can take them years to finalize regulations. Bosch expects that the Trump administration will ask agencies to find savings again in next year’s budget, the details of which will become clear later in the fall. According to Bosch, there are two benefits of the deregulation savings to the average American taxpayer. Meanwhile, fewer regulations result in less burden for businesses to comply with. Though no precise model exists for calculating the total cost for U.S. businesses to comply with government regulations, estimates range from $500 billion to $2 trillion. “If the businesses that you’re purchasing products from are not spending money complying with unnecessary regulations, the cost of their product or service isn’t as great, so they can sell it for a lesser amount. So there should be savings realized for consumers on that end,” Bosch said. The White House also has pushed for deregulation on other fronts. The administration has issued guidance to cut red tape in the approval process for infrastructure projects, and Trump allowed for the Keystone XL and the Dakota Access pipelines to move forward. By December 2017, federal agencies were cutting 22 old regulations for each new regulation. At the time, Trump pushed the government to find even more savings. We have been working around all this for a long time. Most recently we came to understand that Europeans were clearly brown skinned until the advent of a successful agricultural cultrure that then produced large white populations that subsumed the original culture. Just what has happened and is happening to the Indians of North America. It all happened much sooner in Europe and for the same reasons. We are shaping things up nicely though. We have a serious penetration of the Abo lineage into South America long ago and the Polynesians along the west coast then leading to tribal movements as well into the East. After that or simultaneously we had penetration in the north from both directions. I had long understood as much but now the weight of DNA work is cleaning this all up. Scholarly foot dragging is actually collapsing as indicated in California. Geneticists are incessantly changing the facts, while anthropologists remained obsessed with creating simplistic models of the past. Ric Edwards called early Sunday evening, while I was washing paint brushes and baking a pizza, bought at Dollar General. Fortunately, the fixer upper cottage I am in now, has multiple, working telephone receptacles (unlike the rat-infested cabin, that I formerly lived in.) The rat hovel had one working telephone at the extreme end of the structure. I was able to multi-task, while Ric updated me with the latest set of “genetic facts” about indigenous Americans. For those of you, who don’t know him, Ric played a major role in the formation of the People of One Fire and even came up with its name. He and his wife live in the mountains of Texas. He devotes most of his research nowadays to genetics I don’t, so rely on him to tell the current version of truth on that particular date. His Creek heritage can be traced to the Lower Chattahoochee River Basin, but all those towns moved there in the early 1700s from locations to the east. Some of his ancestral families were definitely Uchee from the Lower Savannah River Basin. When Ric and I first made contact around 14 years ago, he immediately discussed his theory that several indigenous ethnic groups reached the Americas by going directly from Scandinavia and Russia to Canada. The Algonquians, Uchee, Arawaks and Panonans have distinctly different blood types and DNA profiles that indigenous groups in the western half of North America, plus the western and southern parts of South America. Look at the latest satellite imagery from ERSI or Google Earth. The North Atlantic is dotted with submerged islands that would have been above the surface of the water during the last Ice Age. Ric and Dr. Gordon Freeman of the University of Alberta believe that the same people once lived on both sides of the North Atlantic. Indeed, the oldest stonehenges are in Canada. The oldest Canadian stone circles predate the oldest Stonehenge in the British Isles (located in Wales) by 500 years. No one has attempted to date the stone circles in northern Georgia. Ric believed that the ancestors of the Muskogeans came to the Americas very early and by water along the edge of the Pacific Ocean. He believed that Proto-Polynesians and Melanesian arrived in the Americas very early. Guess what? In recent years, the oldest skeletons in Mexico are Southeast Asian or Proto-Polynesian. At the time, most of my knowledge base was focused on Mesoamerica, so I just listened and gave his theories serious consideration. After all, it only took the Inuit three centuries to populate the entire Arctic region from Alaska to Greenland. There is no reason to doubt that humans could have traversed the same region in earlier times. There is another bit of evidence. Most indigenous Americans have O+ blood. Only in the Algonquian regions does one see A and B blood types among “full blood” Natives. The greatest concentration of R haplotype is among the Algonquians and Atlantic Coast of Europe. My research during the past two years into the petroglyphs in northern Georgia and shared words among indigenous peoples in the North Atlantic Region is backing up Ric’s theories 100%. Most of the petroglyphs in northern Georgia are identical to those In either Ireland-Scotland or southern Scandinavian . . . depending on the river valley in Georgia. Irish Gaelic, Algonquian, Shawnee, Cherokee and Muskoge-Creek use the same word for “people or tribe” . . . gi ~ ki. The archaic word for “living place” . . . bo . . . can be found in Anglish, Jutish, Swedish, Danish, Panoan (Peru) and Apalache-Creek. The root words of the Old English word borough . . . bo and reigh . . . can be found any many Native American tribal and geographical names in the Carolinas and Georgia. Keep in mind that the Angles and Jutes originated from the same region where there is a concentration of burial mounds and Bronze Age petroglyphs in Sweden. Of course, all commercial labs do not consider those markers to be indicative of indigenous American ancestry, but Ric cannot find any Sami, Finnish or Swedish ancestors from the Colonial Period, so I strongly suspect that they came from his Uchee ancestors. They really should be considered “typical Native American” DNA markers in the Southeast. But alas, there are no DNA test markers for the Uchee, Miccosukee and Creeks. Meanwhile, geneticists have found absolute proof that the aboriginal peoples of the southern tip of South America and a region in the heart of Amazonia were Australoids. They either sailed along the rim of the Pacific to get there or else directioly from Africa. Geneticists have recently discovered that the aboriginal peoples of Northwest Europe during the Paleolithic and Neolithic Periods had dark hair and dark complexions. They were not terribly different in appearance from modern “full-blood” Native Americas. Look at the genetic and blood type maps of indigenous peoples the Americas. They provide a very complex picture of the New World’s past, not a snapshot of a single wave of people coming during a short period over a land bridge between Siberia and Alaska. As we said earlier, small extended family bands of pioneers could have both paddled and hiked from the Old World to the New World from many locations and at many time periods. The Inuit were certainly not the “Lone Rangers” in this endeavor. Once in the Americas, these small bands mingled and had babies, who ultimately evolved into distinct indigenous groups. Long, long ago in a land far away . . . Mexican anthropologists told me that they thought Gringo anthropologists had grossly underestimated the length of time that mankind had been in the Americas. At the time, the official date was 10,000 BC. The Mexican scholars also were convinced that the earliest settlers in their region were Proto-Polynesians. They knew for a fact that the indigenous people of Baja California were Polynesians. European plagues had wiped out most of these people by the early 1800s. When I got back to the States and started giving color slide lectures, the Gringo archaeologists laughed at me when I related what the Mexican archaeologists had told me. For the next four decades, the profession bitterly opposed the suggestion that Polynesians had arrived in North America prior to the “Clovis People” – even though no Clovis points have ever been found in Alaska or Siberia. Their greatest concentration is in the Southeastern United States. Guess what? Last night I watched a National Geo special on the discovery of a very old skeleton on Catalina Island, California. She was a Polynesian, whose bones were unearthed in the 1950s, but not studied until 1999! They were 13,000 years old. This information was suppressed by the “Clovis People” in the profession until 2015, when more Polynesian skeletons were found in Channel Islands. Then in 2016, a chain of Polynesian fishing villages was discovered along the coast of southern California – containing Polynesian style artifacts. California archaeologists have now decided that most of the “American Indians” from Los Angeles southward to the Mexican border, were actually Polynesians. There is still no admission that the Baja California natives were Polynesians. Back in 2005, I took a now-primitive DNA test. It said that I was about 3/4th Nordic (Scandinavian-Finnish), Scottish and Irish. The remainder was Asiatic, including Maya and Polynesian. Polynesian? I thought it was a fluke. Than last year, I figured out that the Wasali/Wassaw People of Wassaw Sound, GA and the Savannah River Basin were probably Polynesians. Their capital was in present day Elbert County, GA, where my mother grew up. They were also in South Carolina as indicated by the English place name, Waxhaw and the Spanish ethnic name, Guasule. Vasa is a Maori and little used Hawaiian word for ocean water. Cousin Ray recently had some much more sophisticated testing done on his family. That test determined that the Polynesian component was most similar to the Maori in New Zealand. Maori? Now you figure that one out. The take home is that a version of TB came from pinnipads long before contact in 1492. Actual transmission may well have been human consumption. We do not prove anything here except that TB in some form was likely global but not a serious problem when compared to other similar agents. More potent variations arose with the sudden rapid mixing brought on by contact which also massively disrupted communities through slaving. Earlier contact was much more benign. It is noted that the Tahitian move to Hawaii was contemporary to Viking exploration. That is interesting but not likely connected. Viking ship damage from fouling made warmer waters quite dangerous actually . Ed Risse, my boss at Richard P. Browne Associated, Inc. in Columbia, MD (when I was in my mid-20s) sent me this article. It typified my complaints about the current state of anthropology in the United States and the blindly obedient journalists, who give them publicity. The article was posted by the academicians as propaganda to refute those who believe people from the Old World reached the Americas between its initial settlement and the arrival of Columbus. The article states that discovery of an African strain of TB in Peruvian seals, proves that sea mammals, not humans visitors from the Old World, introduced TB to the Americas, around 900-1000 AD. What is wrong with this article? Here is a map that will give you a hint. Note the location of Peru. 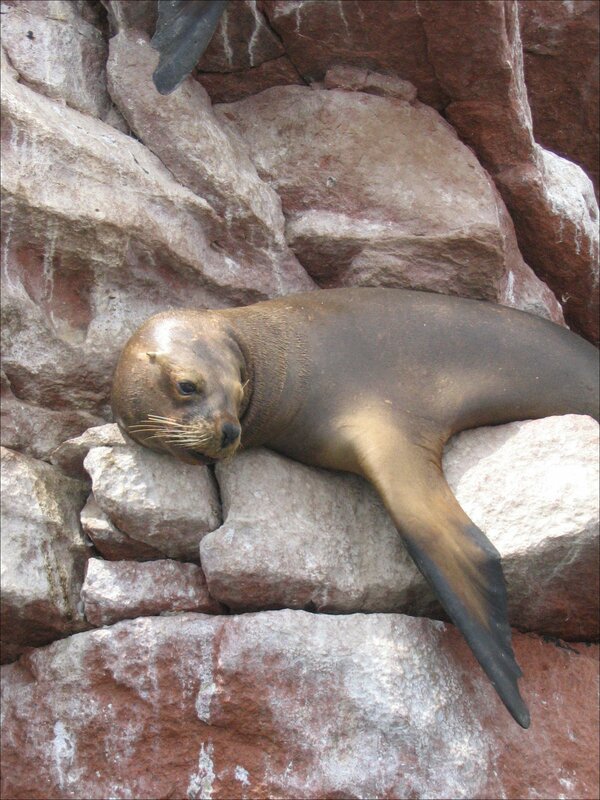 Also, read an article on Southern Seal and Sea Lion migrations patterns. In the summer, they migrate southward to colder waters near the Antarctic Ocean or even Antarctica itself. Also, that time period of 900 AD to 1000 AD does sound a little fishy . . . or should I say “sealy”? It is when a second wave of settlers arrived on the Hawaiian Islands from Tahiti. Well . . . it is also when people with names like Erik, Urik, Ragmar, Heida and Brumhelda were sailing the oceans with their speedy långbåt’s. New archeological evidence suggest that tuberculosis spread to the Americas from sea mammals before European explorers and settlers made contact with the New World, according to results of a study published in Nature. Although modern strains of Mycobacterium tuberculosis from the Americas closely match those from Europe — indicating that human TB was introduced after Columbus — the new findings show that seals and sea lions, or pinnipeds, acquired the disease from humans in Africa and then carried it to the Americas more than 1,000 years ago. Hm-m-m, now who was ranging the oceans in their långbåts about this time? New research shows that tuberculosis likely spread from humans in Africa to seals and sea lions that brought the disease to South America. Stone and colleagues tested genetic samples collected from ancient human remains for TB DNA. Of 76 samples discovered at pre- and post-contact sites in the Americas, the researchers focused on three from Peru dating from 750 to 1350 AD that tested positive for the pathogen. The samples were compared to a large dataset of modern genomes and TB strains found in animals, which revealed that human TB disease was acquired from pinnipeds. According to Stone, the mammalian-adapted pathogen was later supplanted by modern TB strains after Europeans made contact with indigenous populations. “We hypothesize that when the more virulent strains came, they quickly replaced the pinniped strains,” she said. The researchers said the findings implicate the role of animals in TB transmission, and that future research should focus on the relationship between ancient and modern strains. humanoid fossil discovered in south africa? Is China's Day Of Reckoning Coming?